“I made my first presentation to ACRES in 1993 while I was earning my doctorate,” he said. He has been an active member ever since. In March, ACRES honored him with the 2018 Eagle Award. Belva Collins, chair and professor of the Special Education and Child Development Department at UNC-Charlotte, presented the award. 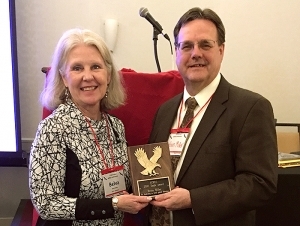 “I was thrilled to present the Eagle Award to Kevin for his lifetime service to the field of rural special education, awarded through a unanimous vote of the ACRES board,” she wrote. “I have known Kevin since he was a doctoral student and have had the privilege of working closely on the board with him for over three decades.” She said that Miller has focused on personnel preparation, children with learning and behavioral challenges, secondary education, and transition. “I really enjoy the advocacy that goes into policy-making,” Miller said. In 2017, he co-authored an article, “Policy Challenges and Opportunities for Rural Special Education,” which was published in Rural Special Education Quarterly. He is a long-time member of the journal’s editorial board as well as a member of the ACRES board of directors, treasurer, and chair of the organization. His most significant contribution may have been his involvement in ensuring that ACRES remained, in Collins’s words, “a vibrant and viable organization” in the early 2000s. During that time, he became membership chair as well as conference chair and was instrumental in expanding the membership and the benefits to them. Still, Miller said that he received far more from ACRES than he ever gave. “I’ve learned about the many types and degrees of challenges people face,” he said. “It puts things into perspective sometimes, and I’ve learned a lot about the many creative ways people find solutions.” He will complete his current term on the ACRES board of directors this year. As he moves forward in his career, he goes with the best wishes of the organization he has served for a quarter century.